430 p., 17,9 x 24,5 cm. Edited and introduced by Immanuel Musäus. 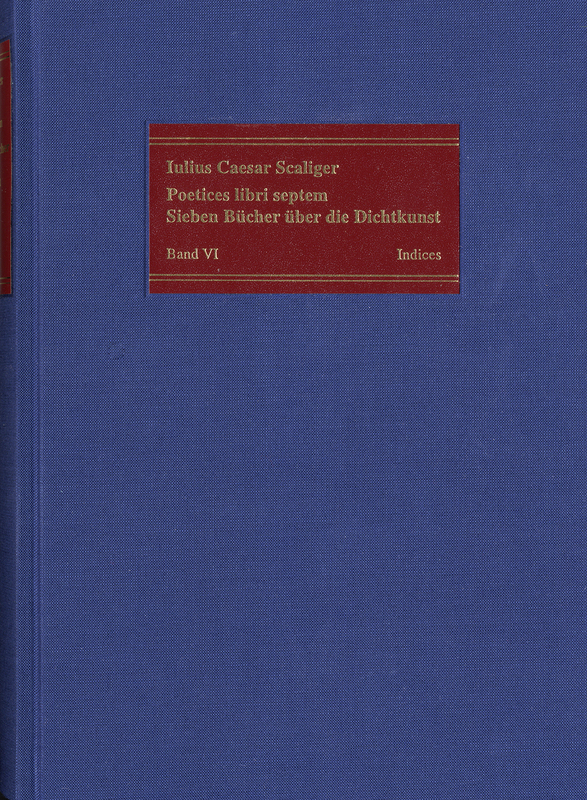 The last volume of the critical edition of Scaliger’s ›Poetics‹ contains the extremely detailed index of the first edition, which significantly controlled and influenced the reception of the work. In this context, the references to the present edition have been changed. In addition, the complete work has been made more accessible by a series of indexes in the modern sense of the word: There is an index of passages in the text which is complemented by indexes of subject, names, rhetorical devices and metrical structures. Hier liegt ein mit äußerster Akribie erarbeitetes, zuverlässiges Arbeitsinstrument vor, das die große editorische Leistung der Textbände vorbildlich ergänzt. The publishers are to be commended for completing the edition with this volume [...] in an age when some would give them only online, if at all. Studying and handling the six volumes of this scholarly monument are, I said, real pleasures. Nous sommes heureux de féliciter la maison d'édition Frommann-Holzboog pour l'achèvement de cette oeuvre aussi importante que savante.